North led the 9 and declarer won with dummy’s ace and played the 8. Which card should South play? If you cover with the ten and declarer plays the jack partner wins and you will get a second trick as long as partner has the seven. 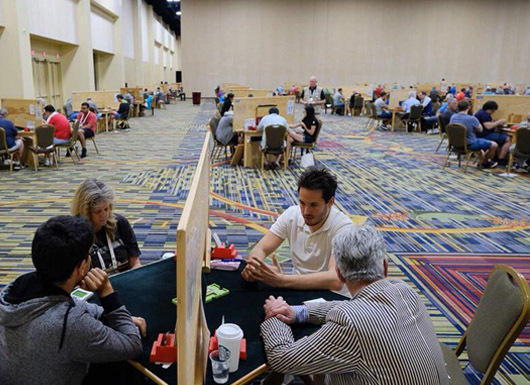 If you play the king, you will always get one trick as long as partner has the queen, and sometimes you gain a tempo, as declarer may duck, playing you for the KQ. Here, declarer will be happy with three tricks, assuming he can guess the location of the Q. Here South played the ten and North took declarer’s jack with the queen and continued with the 10, South overtaking with the queen and declarer winning and running the J. When it held he played a heart to the king followed by the nine of clubs, covered by the king and ace. Declarer could give up a club and claim, +600. 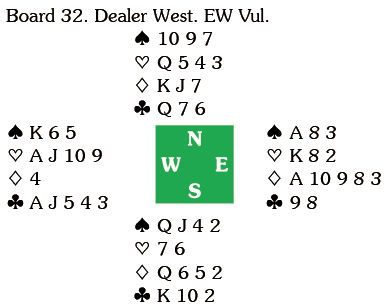 Here North led the 10 and declarer won with dummy’s ace and played the 9. South went up with the king and when it held he returned a spade, declarer taking the king and running the heart ten. A heart to the king was followed by the 8 for the jack and queen. North switched to the K, but declarer won, came to hand with a heart and cashed the A – no swing. In the Rand, M Shen made nine tricks – South covered the 9 with the ten – but Lall took eleven! When he played the 9 South ducked and when he got back in with the K declarer took a heart finesse against North, repeated it, unblocked the K and played a club for eleven tricks. That leaves one result outstanding – and I am sorry to relate that declarer went two down to give Baker 13 IMPs.